Hi guys! 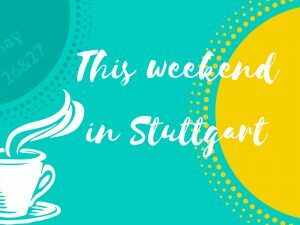 Even though “living in Stuttgart” isn’t a blog for tourists but for you guys who live in this beautiful city already, I thought a post about a half-day-trip through the city center of Stuttgart might come in handy when friends and family come visiting you. So here are my personal highlights, all combined in one fun Stuttgart city center walking tour. 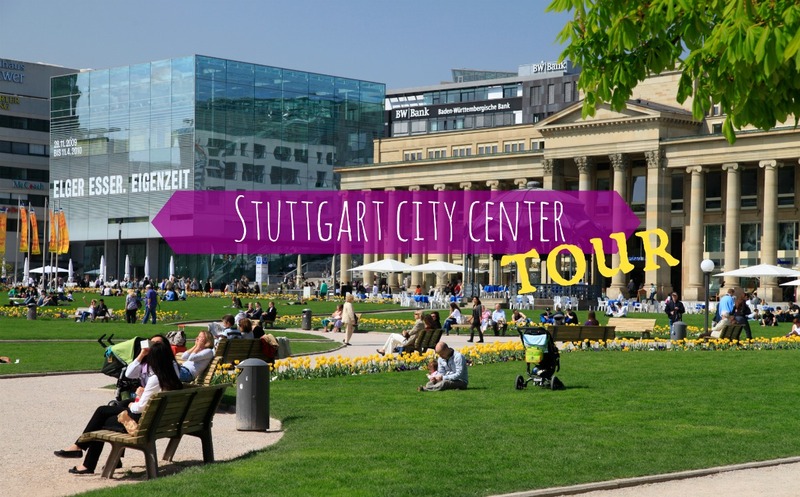 I suggest starting your Stuttgart city center tour at the main station. This might be the place where you pick up your visitors anyway, plus it is very central and easy to find. Local fun fact: The little crèpes stand at the beginning of Königstraße, right next to the stairs leading down to the S- and U-Bahn is THE meeting spot for locals! 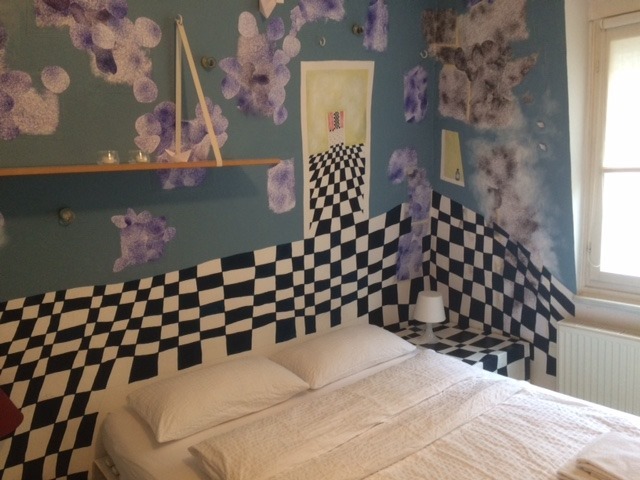 But if you’re in doubt whether your friends might find it, you can also choose the office of the tourist information I-Punkt on the other side of the stairs. Start your tour with a panorama view. Simply climb the 300+ stairs of the train station tower and enjoy the view. You can even point out the sights you will visit next. This treat is even free of charge! It is only a short stroll from the main station into the park and over to the historic opera house. 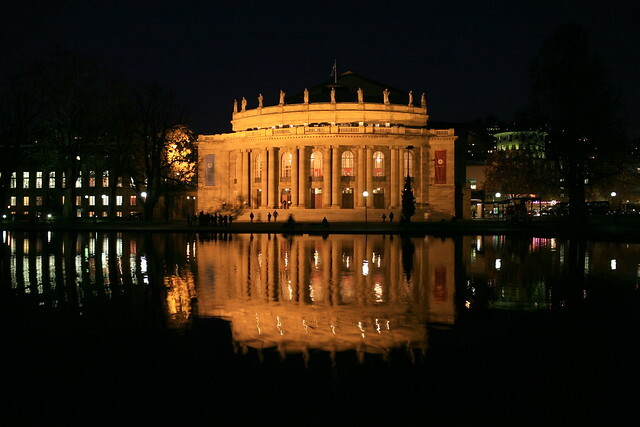 Fun facts to impress your visitor: The Stuttgarter Staatstheater are a multi-branch-theatre, including the opera, the drama theater and the famous Stuttgart ballett. It was built between 1909 and 1912. The original drama theater got destroyed in WWII and a new building is home of the theater now on the very same spot. The opera however is one of the few opera houses that survived the bombs. Don’t miss the art nouveau fountain on the left of the opera house. It is dedicated to opera singer Anna Sutter who got killed by her lover in 1910. 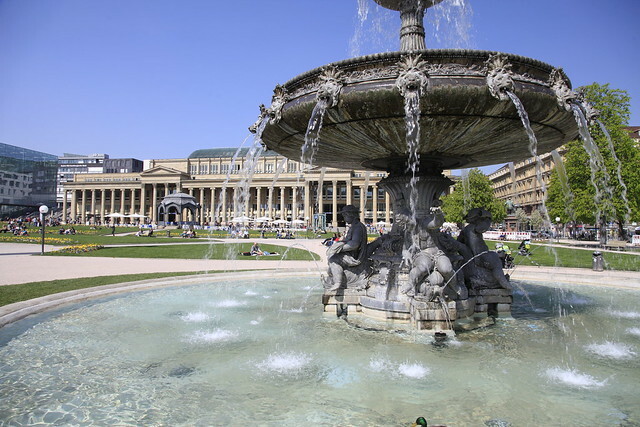 It is called Schicksalsbrunnen (fountain of fate) and symbolizes the ups and downs of life. We move on towards Neues Schloss. Fun facts concerning the New Palace: When duke Carl Eugen of Württemberg came to Stuttgart in 1744 to assume his throne he demanded a new residence and even threatened to move to Ludwigsburg if he would not get what he asked for. Thus, Neues Schloss was built. The cornerstone was laid in 1746 and the residence was completed in 1807. Nowadays the palace contains government offices and is only open to the public on special occasions. When we are standing in front of Neues Schloss, we are already at Schlossplatz. Fun facts: The square was built to host military parades and was not open to the public at first. 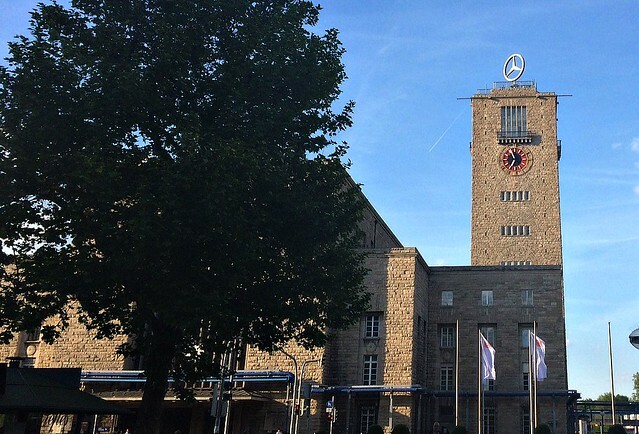 The square was redesigned in 1977 to host a Bundesgartenschau. 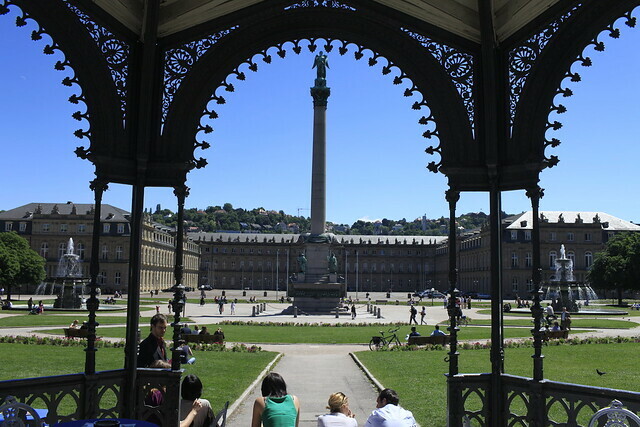 It is home to baroque gardens, two beautiful fountains, the jubilee pillar with goddess Concordia and the little music-pavillion that makes a great picture motive. 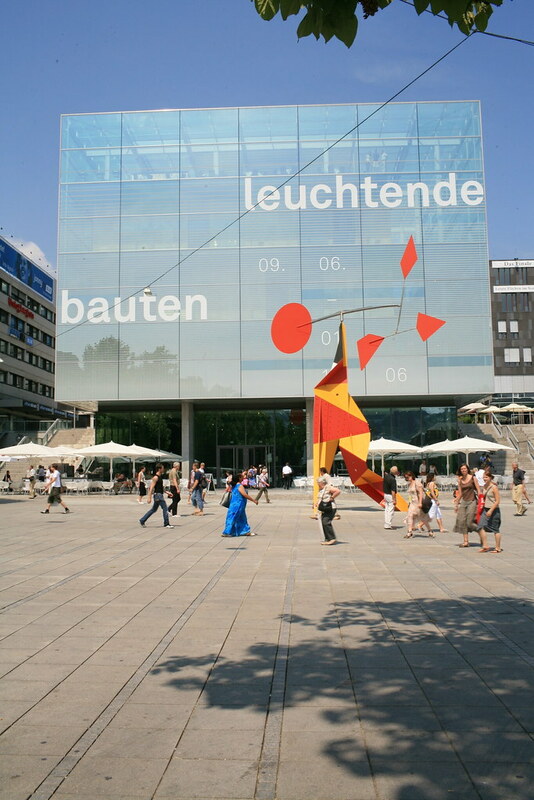 From Schlossplatz we see our next stop already glittering in the sun: The Kunstmuseum hosts contemporary and modern art and was built in 2005. Fun facts: Even though it doesn’t look that big from the outside, a tunnel system streches its display space to 5000 m²! 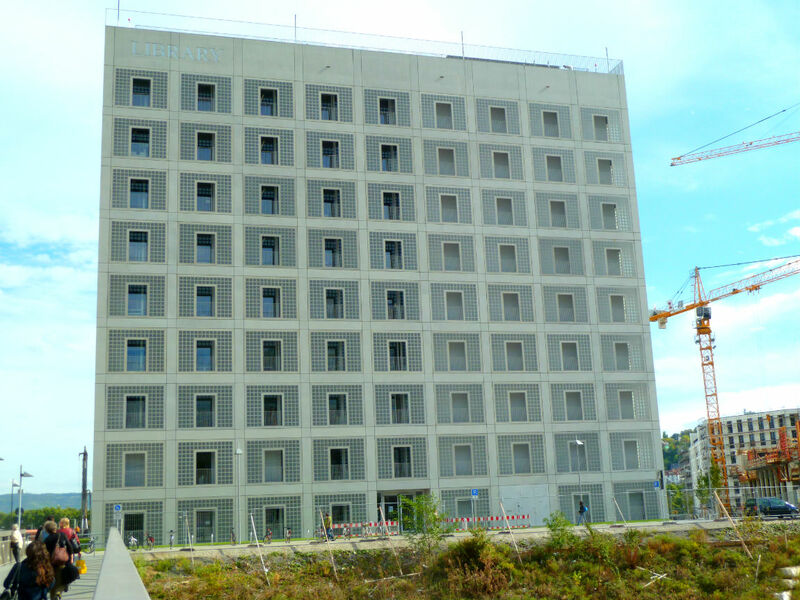 The plans of building were looked at controversial by the people of Stuttgart because the beloved Freitreppen had to move for the construction. Eventually, a compromise was found and thus there are still stairs next to the glass cube where you can see people sitting and chatting on warm summer days. By the way, the restaurant on top of the museum offers amazing views and is also open for coffee and tea during the day! We follow Planie road and turn right where we arrive at Schillerplatz. 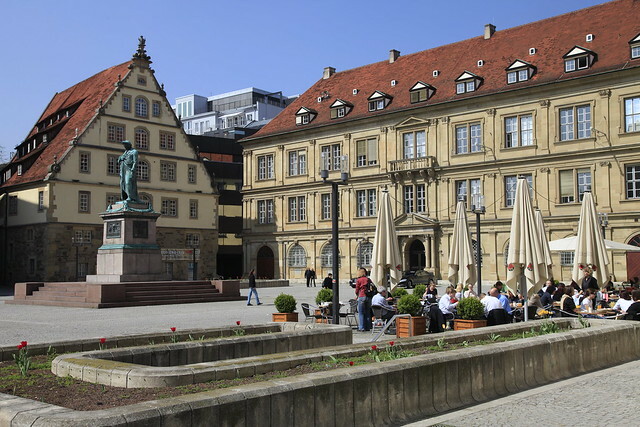 Fun facts: The statue of the German poet Friedrich von Schiller gave this square its name. 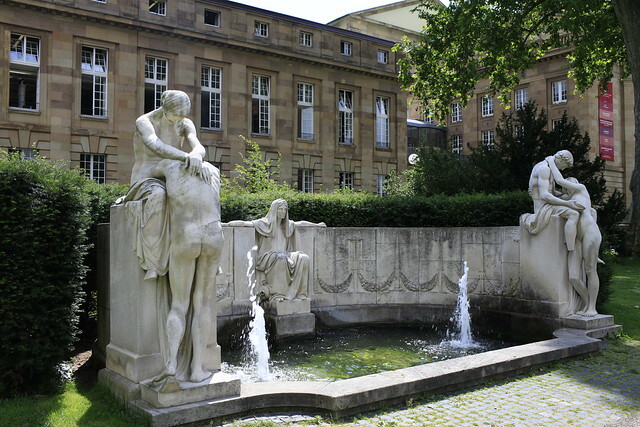 Schiller used to live several years in Stuttgart. This was actually the first memorial erected for Schiller in Germany! But there is more to see on this square: Nestled in the corner is the Fruchtkasten, one of the oldest houses in Stuttgart. Next to it sits the Stiftskirche (Collegiate Church) with its two unsimilar towers. The earliest parts of this church stem form the 10th or 11th century. Since then Stiftskirche has had a changeful life and it displays parts of romanesque, early- and late-gothic, renaisance and baroque origin. 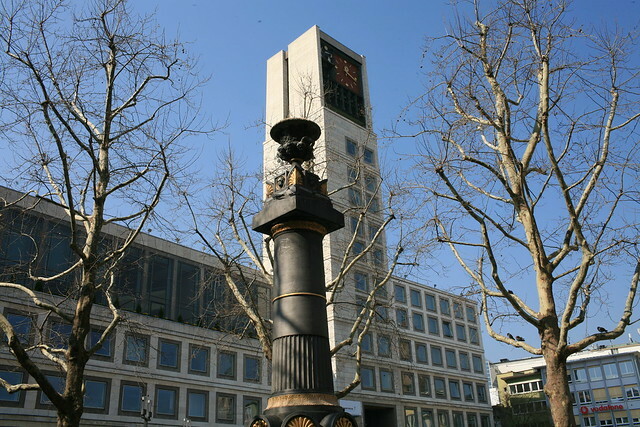 If you are starting your tour early on a Tuesday or Thursday morning, you will get to hear one of Stuttgart’s loveliest traditions: Four brass players will climb up one of the towers and perform for ten minutes, starting at 8:45 am. This tradition started in 1618! But there is one more main attraction we musn’t miss: Altes Schloss! The history of this castle goes back to the 10th century when a Wasserschloss was erected on this area. 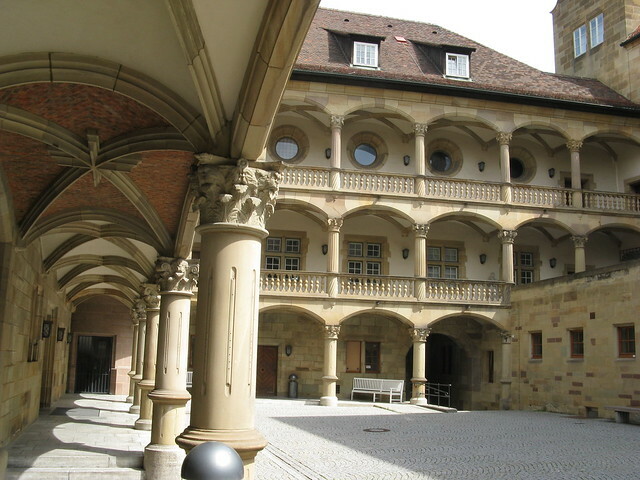 Step inside to see the arcaded courtyard and a monument of Eberhard I. If you walk around the castle you will find a tiny museum at it’s back. It is dedicated to Claus Schenk Graf von Stauffenberg who tried to assassinate Adolf Hitler on 20 July 1944. 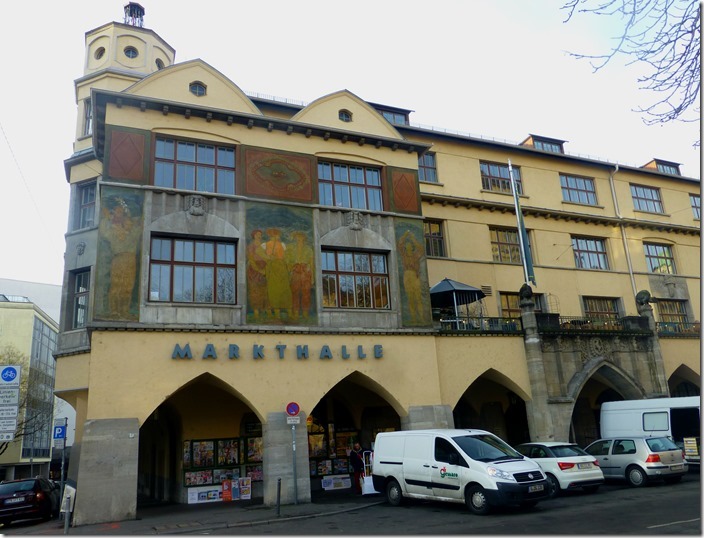 Next to Altes Schloss we find the grand art nouveau building of the Markthalle. Here you find high quality native next to international products and the delicious smell will draw you in even more. Definitely a great place for a short break and to grab something to eat. If you want to get a good view and/or picture, climb up the stairs to the first floor. Fun facts: The market hall was erected between 1911 bis 1914. A curved glass roof spanned the 60 X 25 meter Hall, offering daylight for the presentation of goods. Paris’ Les Halles served as a model for the covered market hall. We now arrive at Marktplatz and the Rathaus. Unfortunately the old late gothic city hall, that got destroyed during WWII, didn’t serve as a model for the new Rathaus. The building we see today was erected between 1953 and 1956. I have to admit, the building is not much beloved but well, we have to live with it. But what is loved by the young and the young at heart are the old fashioned elevators called paternoster that still run inside the building! Please feel free to step inside the city hall, turn left and hop in one of the wooden cabins! When we have had enough of riding up and down the building in the paternoster we leave the city hall and walk to a place that is very popular amongst young people: Hans-im-Glück-Brunnen. The area surrounding the “Lucky Hans” fountain has become THE place to go for a fun night out. 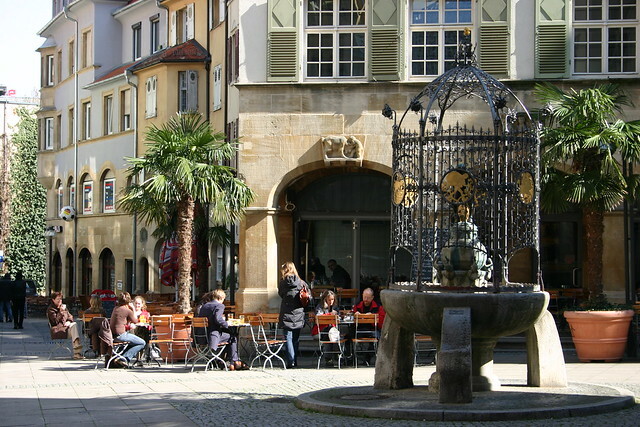 Here you find lots of bars and restaurants – and of course the pretty fountain (picture opportunity!!). Let’s take a closer look: Six bronze plaques display scenes from the fairy tale “Lucky Hans” written by the brothers Grimm. Hans had to lose all of his possessions before he found true fortune. Fun fact: The area surrounding the fountain is only a century old! But its medieval look doesn’t come from nowhere: The town planners wanted to create exactly that, an idyll of bourgeois life! Well done, I have to say. Either we stay here, have a beer or cocktail and call it a day (or night, depends on when you have started your tour :-)) or we head on, towards Feuersee. 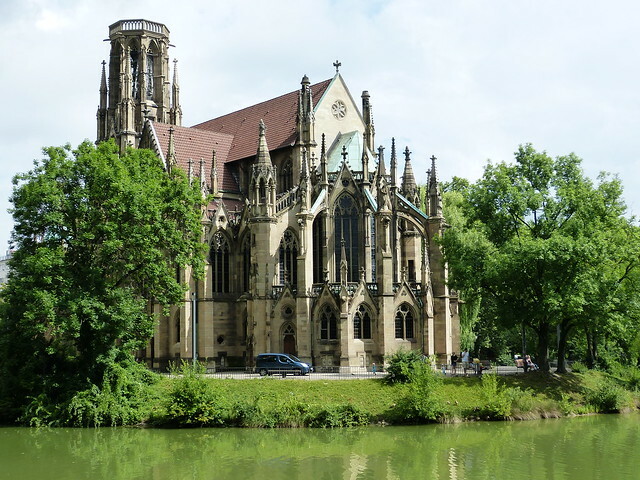 Here we see one of the prettiest churches in Stuttgart – even though its tower is damaged from war. The gothic Johanneskirche is thus a symbol for the destruction of war until today. We can sit down on the newly created stairs that lead down to the lake and watch turtles swimming in the water (yes, some wild turtles live here!) and kids navigating their toy boats over the water. Now we hop into the S-Bahn and ride back to Hauptbahnhof. From here we can catch a U-Bahn to station Stadtbibliothek. I know, this is a detour and you might be tired by now, but believe me, you want to show your guests this last sight! The new city library opened its gates in 2011 and won many prices ever since. Even though it doesn’t look like much from the outside (I like to call it book prison…) trust me: step inside, take the elevator to the top floor and look down and you will know why this is such a special place! The stairs and the setting look surreal! When the weather is nice, you should step outside and climb the last flight of stairs to the top of the building. Here you and you visitors can enjoy another nice view and even relax on one of the sunbeds (they do sell ice cream in the little café by the way – wink wink). From Stadtbibliothek you can walk back to Hauptbahnhof or take the U-Bahn.